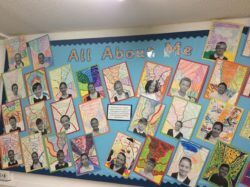 We introduced ourselves to Mrs Harris and Mrs Bennett by describing our strengths, hobbies and interests. 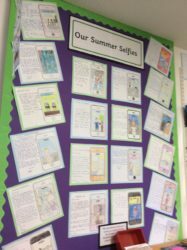 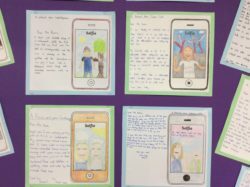 We described an activity or outing we enjoyed over the summer holidays and illustrated our work with colourful ‘selfie’ pictures. 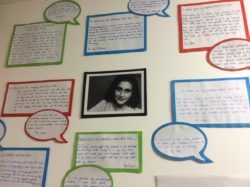 In English we have been reading about the life of Anne Frank. 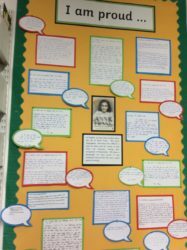 We have written biographies, describing how difficult life was for Anne and her family as they hid from the Germans during their occupation of Amsterdam. 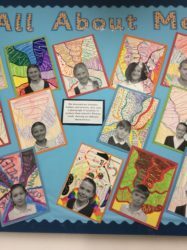 We chose a paragraph we felt proud of and explained why we felt this was a good piece of writing. 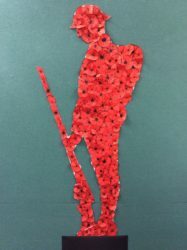 In our sharing assembly this term we remembered the sacrifices and bravery of soldiers who fought in the First World War and the people who supported them We read out poetry against this backdrop of a soldier’s silhouette, made from individual poppies.